I got this cd from a friend who hit me in the back of the head with it, but it was a pretty good toss though, since I've actually come to like it quite a bit. It is rather pop-oriented electronic drum'n'bass with a lot of distortion and noise. There's a ton of guest vocalists/artists including Enter Shikari, Jenna G and Rob Hawkins of The Automatic. It all boils down to an album of quite some variation but also to a very consistent album. If you like a fast electronic album and you ain't afraid of drum'n'bass then you better go check it out. There's a good chance you might find some of it interesting. 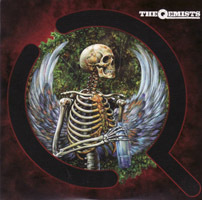 The Qemists comes from Brighton in the UK and the band has three bandmembers: Dan Arnold, Leon Harris and Liam Black.